This is my first deal post so please go easy and excuse any mistakes! 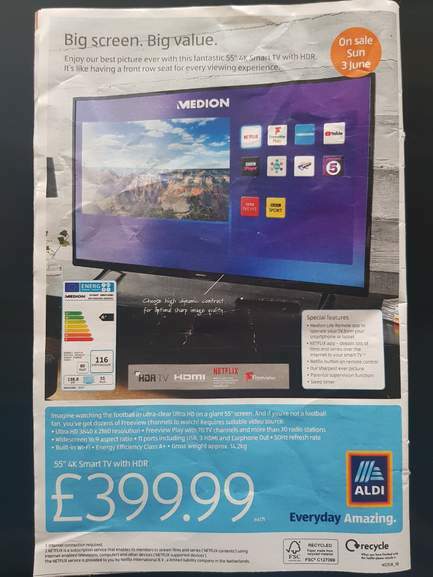 I just spotted this on the back of an Aldi deal paper as below. On sale 3rd June. I'm sure this isn't to everyone's taste but seemed a reasonable deal on casual inspection. No deal details online yet at first glance. Does the magazine list a model # for the TV? It will almost certainly support 50Hz/60Hz. A lot of manufacturers seem to do this when they really mean it's 50Hz PAL compatible. Not specifically that I can see but maybe some of the information from the top of the energy label includes this. Hopefully there will be more information online next week. Hi,Not specifically that I can see but maybe some of the information from …Hi,Not specifically that I can see but maybe some of the information from the top of the energy label includes this. Hopefully there will be more information online next week. Unfortunately both Google and the Medion support website don't recognise any of the part numbers. Will have to wait and see. with the world cup approaching your gonna see the usual push for supermarket tv,s,probably comes with the so called bog standard 12 months warranty,which if you do yah research is actually at least 2 years or even more if you know yah european consumer rights.hard to guage if this is a deal because we dont have the full specs of the tv yet, to compare to others,but thanks for the heads up anyhow. [Image] Hi,Not specifically that I can see but maybe some of the …[Image] Hi,Not specifically that I can see but maybe some of the information from the top of the energy label includes this. Hopefully there will be more information online next week. That labels from 2017, so I'm guessing it's been sold before if anyone purchased it previously any Good ?. with the world cup approaching your gonna see the usual push for …with the world cup approaching your gonna see the usual push for supermarket tv,s,probably comes with the so called bog standard 12 months warranty,which if you do yah research is actually at least 2 years or even more if you know yah european consumer rights.hard to guage if this is a deal because we dont have the full specs of the tv yet, to compare to others,but thanks for the heads up anyhow. 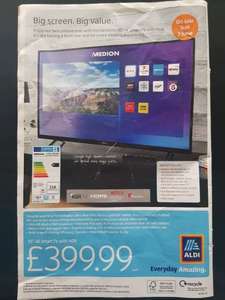 Would be unusual for combination of Aldi+Medion product to be offered with less than 3yrs warranty, but no doubt simple to clarify in store. €499 = c£437 ...so the price is in the right ball park. That labels from 2017, so I'm guessing it's been sold before if anyone …That labels from 2017, so I'm guessing it's been sold before if anyone purchased it previously any Good ?. The 2017 in the label footer simply indicates the energy scale group which will not change until 2020 (when A+++ will be added to label group options), so the TV may not have been energy assessed until 2018. 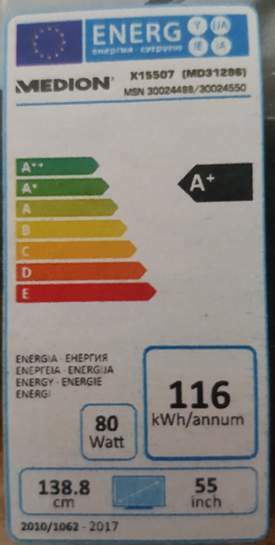 The 2017 in the label footer simply indicates the energy scale group which …The 2017 in the label footer simply indicates the energy scale group which will not change until 2020 (when A+++ will be added to label group options), so the TV may not have been energy assessed until 2018. Ok, thanks. Makes me laugh though a+++ is that equivalent to giving 150% on something. Ok, thanks. Makes me laugh though a+++ is that equivalent to giving 150% …Ok, thanks. Makes me laugh though a+++ is that equivalent to giving 150% on something. But I assume this TV is just a rebadged Vestel, it looks exactly the same as the 55" Logik I got recently for £300. 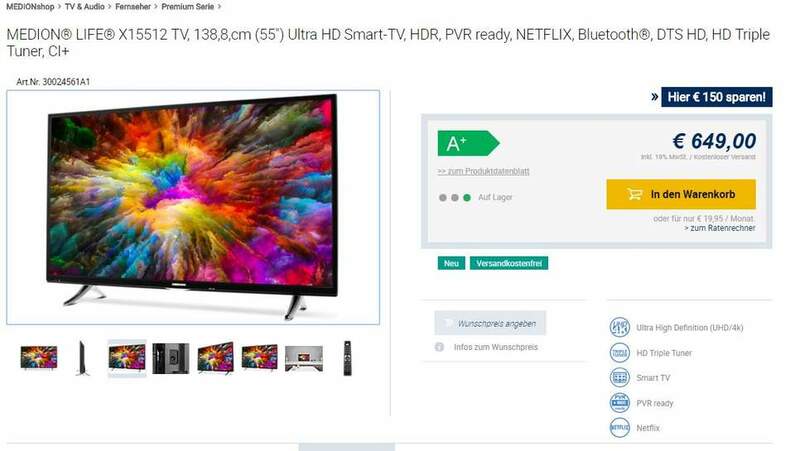 But I assume this TV is just a rebadged Vestel, it looks exactly the same …But I assume this TV is just a rebadged Vestel, it looks exactly the same as the 55" Logik I got recently for £300. Does it have YouTube app? Or you can get the Hisense which may be similar in spec and quality from Richer Sounds that offers a 6 year warranty. Never buy a medion talking through experience with the power board capacitors burning out and very very poor customer services. Good job on you. First deal and it's gone hot and featured in the HUKD WhatsApp too. I’d be more sceptical of your spelling though! 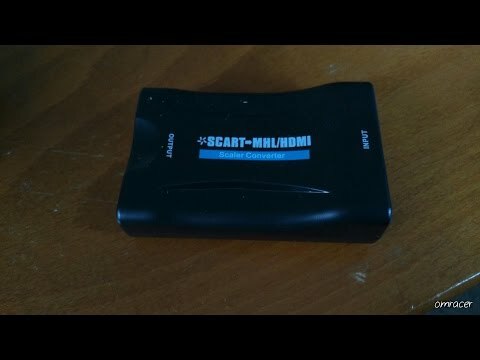 How would I connect a VCR /DVD player with scart to this TV please? Curious, there is no SCART port visible in the picture of the back of the TV. May be it is mounted sideways. Deal posting newbie! This is IainP first deal post. Help out by leaving a posting tip or just to show your appreciation for their contribution.